So I finally downloaded my camera card, and realized I have way too many things I haven’t shared yet! But I decided to start with birthday cake, well because who doesn’t love birthday cake?! It has become somewhat of a tradition around here that I make my own birthday cake and then have friends over to share in eating it. Now there are those people who think that you shouldn’t have to bake on your birthday – but I would assume those are people who don’t like baking as much as I do. Really there is no other opportunity to make exactly the kind of birthday cake you’d like from start to finish, and I like to take advantage of that. Now this year I went overboard (and for me to say that is really saying something!). I decided to make a completely separate recipe of overly complicated cupcakes in addition to this three layer cake, and truthfully by the end of the day, I was starting to wonder if I’d get it all done before my birthday was over. Thankfully, John helped out a lot, but for my future reference and yours: this cake is plently on it’s own – both in terms of amount of cake and work. First you start with a rich, moist dark chocolate cake. To really get the dark chocolate effect you should invest in some dutch processed (or dark) cocoa powder. I made the layers a day ahead, but I would guess you could even make them several days in advance and store in the fridge because they are so moist. Then you create a salted caramel, which will flavor the swiss meringue buttercream filling. Personally, I’m still kind of on the fence about swiss meringue buttercream, but I thought it worked well in this recipe because it’s not overly sweet like traditional buttercream. It also happens to be very stable, and so is able to adequately support the layers of this cake. Finally, you top it all with a dark chocolate ganache frosting and some decorative fleur-de-sel. Although it would be really hard to top the malted chocolate and marshmallow cake of last year, this cake came close. 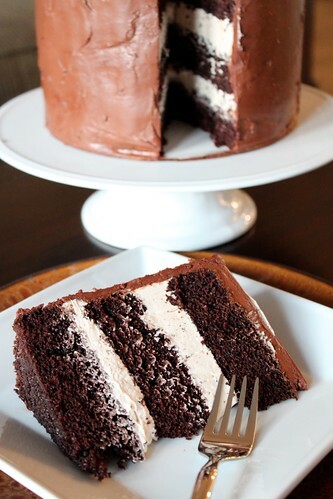 Since I’m partial to six layer cakes, I think if I made this again that I would cut each layer in half, and then fill the additional layers with a small amount of plain salted caramel. (Simply double the recipe for caramel below.) Compared to the cupcakes I made, the caramel flavor was fairly subtle in this cake, and I think that would help to make it stronger. And if you want to save yourself some time, a traditional carmael buttercream like the one used here, would also work for the layers. This cake was quite rich, and so I decided to freeze some to take home for a second birthday celebration, and I can also say that it freezes wonderfully! 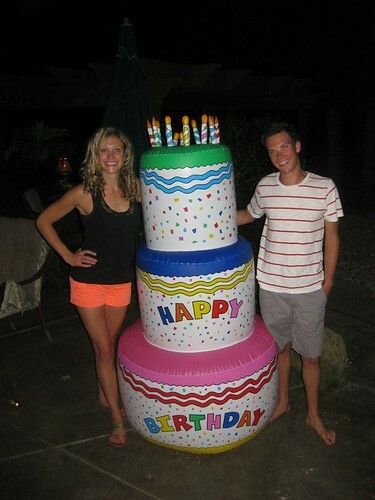 Since my brother and I were born on the same day (5 years apart) we always try to get together for a fun birthday celebration – we kept it fun this year with an inflatable cake, and of course an entire table filled with desserts :-)! 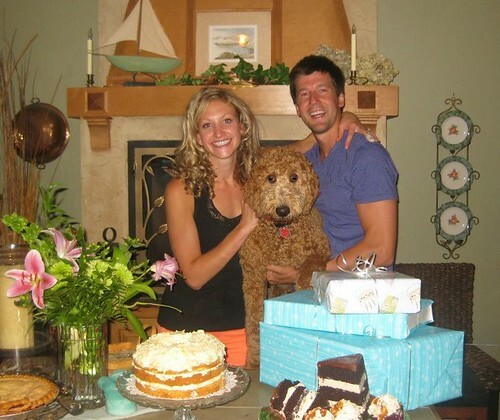 To make the cake, preheat the oven to 350˚ F. Grease and flour the edges of 3 8-inch baking pans, shaking out the excess. Line the bottoms with rounds of parchment paper. In the bowl of an electric mixer, combine the flour, sugar, cocoa powder, baking soda, baking powder, and salt. Mix on low speed to blend. Add the vegetable oil, buttermilk, coffee, eggs, and vanilla to the bowl and mix on low speed until well blended and completely incorporated. Divide the batter evenly between the prepared pans, using a kitchen scale if desired. Bake 20-25 minutes, or until a toothpick inserted in the center comes out clean. Let the cakes cool in the pans about 15 minutes, then invert onto a wire rack and allow to cool completely. Remove the parchment paper. Can be wrapped in plastic and stored in the refrigerator prior to assembly for 1-2 days. To make the caramel buttercream filling, place ½ cup plus 2 tablespoons of the sugar in a medium saucepan. Mix in the water. Bring the mixture to a boil over medium heat. Stop stirring and let the caramel cook, gently swirling from time to time, until it is a deep amber color (test a drop on a white plate or bowl if necessary), watching it carefully to avoid burning. Remove the mixture from the heat and slowly whisk in the cream and then the salt. Set aside and let cool. Reduce the speed to medium and add the butter, 2 tablespoons at a time, adding more once each addition has been incorporated. If the frosting looks soupy or curdled, continue to beat on medium-high speed until thick and smooth again, about 3-5 minutes more (or longer – don’t worry, it will come together!) Blend in the cooled caramel until smooth and completely incorporated, scraping down the sides of the bowl as needed. To make the frosting, place the chopped chocolate in a heatproof bowl set over a pan of simmering water. Heat, stirring occasionally, until the chocolate is completely melted and smooth. Set aside and let cool to room temperature. In a small bowl, combine the cocoa powder and water and stir until smooth. In the bowl of an electric mixer, combine the butter, confectioners’ sugar and salt. Beat on medium-high speed until light and fluffy, about 5 minutes. With the mixer on low speed, gradually blend in the melted and cooled chocolate until well incorporated. Blend in the cocoa powder-water mixture until smooth. To assemble the cake, level the cake layers to get a more stable and cylindrical cake. Place one of the cake layers on a cake board or serving platter. Top with half of the caramel buttercream and smooth in a thick, even layer. Place a second cake layer on top and smooth the remaining caramel buttercream over that. Place the final cake layer on top. 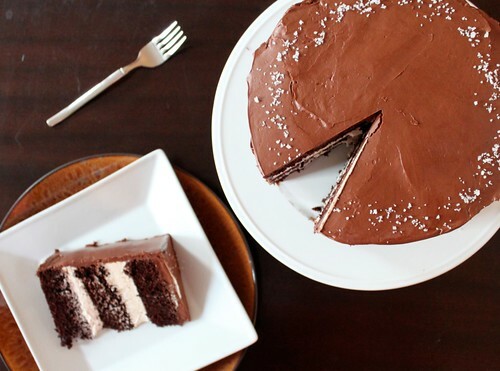 Cover the top and sides of the cake with the chocolate frosting and smooth with an offset spatula. Refrigerate until ready to serve. Before serving, sprinkle with fleur de sel. This entry was posted on August 21, 2012 by Spice Is Nice. It was filed under Cake, Dessert .